Photo by Brandon Cole. All rights reserved. Courtesy of Explore the Salish Sea: A Nature Guide for Kids. If there is an award for the most beautiful book of the year, a new natural history of the Salish Sea must surely be in the running. Never mind that it is a book for kids. Explore the Salish Sea by Joe Gaydos and Audrey Benedict will elicit oohs and ahhs from even long-time residents, but the authors hope that kids especially will be drawn to the story. Dozens of glossy photos support key facts about the Salish Sea, ranging from the ecosystem's creatures to its complex geology, all of it geared toward fifth- and sixth-graders. The book was published recently by Little Bigfoot, a division of Sasquatch Books in Seattle, and I caught up with one of its co-authors, Joe Gaydos during his speaking tour of schools in the area. Gaydos is the science director of the SeaDoc Society and also a member of the Encyclopedia of Puget Sound editorial board. His co-author Audrey Benedict is the founder and director of Cloud Ridge Naturalists, a non-profit based in Colorado. I interviewed Joe in-between bites of sushi at a downtown restaurant in Seattle where we started, appropriately, with one of my favorite facts from the book. Jeff Rice: You were telling me an interesting fact about the Pacific giant octopus — that it can actually taste with its fingers. Joe Gaydos: Right, they taste with each individual sucker. It’s like a mini brain and a mini taste bud for them. And so when they grab something, they can taste what it is. It’s like having taste buds on your fingers, but having 2260 fingers. Pacific Giant Octopus suckers. Photo by Brandon Cole. All rights reserved. Courtesy of Explore the Salish Sea: A Nature Guide for Kids. JR: And that’s in the book and there are all kinds of interesting facts like that. I confess that even though I spend a lot of my time thinking about the Salish Sea — it’s part of my job — there were things in the book that I didn’t know. JG: I love hearing that. That’s good. JR: It must have been a lot fun writing the book. JG: Yes, it was fun because I was able to channel my inner fifth-grader. I think my wife will tell you, I’m just a grown-up fifth-grader. And so, I was really able to think: What will a fifth- or sixth-grader think is cool? And then inspire them to want to learn more and love this place that is in their back yard. JR: Why did you want to reach fifth- and sixth-graders in particular? JG: There were a couple of things about that age. One, just scientifically speaking, in class they are starting to lean about ecosystems, food chains, trophic levels, photosynthesis, evolution... So, all of the components that they’re learning about in school, all the Washington state core science curriculum components are in that book. But it gives them a local example of what they have to learn. So it was a nice fit. Even though it’s not designed to be a textbook, it’s an easy thing to slip into curriculum for them. The other thing is that at that age, right around when you are in fifth and sixth grade, your mind is starting to open broader than yourself and you’re starting to kind of look around at the world. I think it’s a really powerful time when we develop our sense of self and who we are and what makes us who we are. Being able to get kids to think about where they live as being part of who they are was really important. JR: It seems like you picked a lot of things that would really appeal to a fifth- or sixth-grader. A lot of fascinating facts. Is it just a collection of cool facts or is it more than that? JG: It’s more. If you read the book, you will have an overall understanding of how the ecosystem was made and how it works and what cool stuff is in there. So it’s really like one-stop-shopping for a kid or parent. JR: What’s your favorite 'kid fact' in the book? JG: Oh, let me think about that. The thing that gets them jazzed, where they go ooh... Well, we have this one photo on the cover, of a sea lion. And it’s looking right at you. And it always gets these awws. Then I talk about, 'OK, imagine if you had to do most of your important life functions under water while holding your breath.' That animal will sleep at the surface, but really most of the important stuff it does to survive happens under water even though it breathes air. And [the kids] get this perplexed look. And I say 'OK, everybody, hold your breath.' And most kids start breathing out about 30 seconds into it. I say, 'Look, that animal can hold its breath for ten minutes no problem.' And it changes how they think about animals. So I like that. Steller sea lion. Photo by Jessica Newley. All rights reserved. Pacific Giant Octopus suckers. Photo by Brandon Cole. All rights reserved. 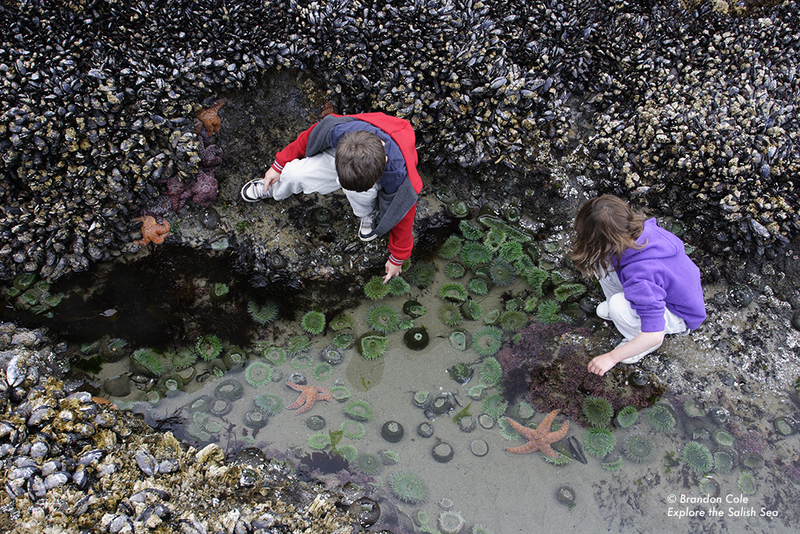 Courtesy of Explore the Salish Sea: A Nature Guide for Kids. JR: You make a bold statement in the book. You say the Salish Sea is unique. How is it unique? JG: Well, I think even structurally, if you look at a map of the world’s oceans you really will struggle to find a place that is such a self-contained sea. If you have some place like the Chesapeake Bay, it’s not surrounded by mountains like that. It doesn’t have this kind of unique flushing system that we have. It wasn’t made by glaciers, so it’s not really deep like we have here. It doesn’t have these big fjords. And frankly it doesn’t really have the diversity that we have. The other thing about this place that’s unique is that it is this amazing ecosystem that is bordered by so much humanity. Eight million people. And I even went and I did the census information for all the counties and states. So I feel good about that figure. JR: I suppose everybody thinks that where they live is special, but I do think there really is something absolutely unique about the Salish Sea. JG: Right. And if you ask people to name special wild places in the world, people might say Everglades, Serengeti, Amazon. They would have places that they name. This place could be on that list because it’s special around the world, not just here. JR: Do you think the parents of the kids are going to read this book too? Are they going to learn anything? JG: I hope so. The nice thing about it is I’ve talked to people who have read it to their kindergartners or first-graders, and I’ve talked to people who have had their kids read it in sixth or seventh or eighth grade or even a little above. I think it has a wide range of appeal. JR: It seems like you’ve had a good response so far. You also wrote a book for adults about the Salish Sea three years ago [The Salish Sea: Jewel of the Pacific Northwest], which was a big hit. Why did you want to then write this book to follow up? JG: One, we saw a lot of pictures of moms and dads reading to their kids. But we [also] realized that one of the goals in the first book was to get people to know this place so they would want to connect to it and protect it. We realized conservation is a long-term deal. So it’s not like we can dump everything on the kids to say 'Oh, we’ve screwed it up you’ve got to fix it.' That’s a lot of responsibility, but we’ve got to start now if in ten years we want to have a cadre of young adults that are voting and thinking about this place in a positive way. And fifth and sixth grade is a perfect age to do that. That was really the motive to say let’s start now getting everybody connected. And it’s a day and age where honestly not that many kids go to the beach or go outside even... If some teacher or some book doesn’t get them wanting to explore this place, they’re not going to want to take care of it. JR: Let's talk about the photos. The images are incredible. JG: There are a lot of new ones. We started this book a year after the other one [The Salish Sea: Jewel of the Pacific Northwest] came out. And we had a big call for photographs. The woman that we worked with is just amazing: Wendy Shattil. We looked at 1200 new photographs. Warbonnet fish. Photo by Brandon Cole. All rights reserved. Courtesy of Explore the Salish Sea: A Nature Guide for Kids. JR: The colors are amazing. It’s like the Wizard of Oz almost. Suddenly everything is in color. I really didn’t realize the Salish Sea was so colorful. JG: I know. And I made that mistake when I moved here. I just thought, 'Oh, you know, it’s not a tropical reef.' But then when you realize how beautiful it all is, it’s either the worst kept or the best kept secret. Because people don’t know that. They don’t look at Elliott Bay and imagine there being all this cool stuff down there. JR: So you think people still aren’t realizing this? JG: We have something like a thousand people a week moving here. A lot of them don’t even know if it’s salt water. Really. And [many people] have not heard of the Salish Sea [Editor's note: The name "Salish Sea" was not officially recognized by the State of Washington until 2009]. People say 'Why haven’t I heard of that? I’ve lived here my whole life.' And I say it’s OK, it’s new. JR: One of your goals is to get this book out for free to a lot people. Tell me a little bit about that. JG: So, one of the things I realized is that ecosystem degradation — toxins, air pollution and so on — it’s not discriminatory, you know? Whether you’re a Republican or Democrat, your kid’s going to get asthma if you’ve got bad air quality. And the truth is poor kids are disproportionally affected by ecosystem degradation. It’s not Medina where we’ve dumped the legacy POPs. It’s down in the Duwamish Valley, right? This is for everybody. So the only way we figured we could spread that [message] was to say let’s get money for free books. Basically, any Title I school, any teacher that calls up and says 'Look, my kids can’t afford this,' we just send them a copy.